The injuries from a trucking accident are often massive. In a match between large trucks and cars, cars lose – and their occupants too often pay the ultimate price. For trucking accident victims, the personal and economic burdens can be overwhelming. Controlling the amount of sleep truckers are required to get. Limiting the number of hours truckers can drive daily and weekly. Specifying highway following distances between trucks. Nearly 110,000 men, women, and children are killed or injured each year on our highways in crashes with big trucks. Those are just statistics unless it’s happened to you. Approximately one out of every for semi-trucks, upon inspection, have been found to be so mechanically deficient, that it is illegal for them to be operating on the roadways, and they are declared out of service. These chilling statistics of injuries, deaths and illegally operating and unsafe semi-trucks are simply unacceptable. Changes must be made in the trucking industry to protect our friends, our families, and the American motoring public. If you have been in an accident with a truck, it should be investigated as soon as possible. Trucking companies require their drivers to contact the company immediately who will begin a thorough investigation with their insurance company. The insurance company has experienced investigators and attorneys on their side, you should have the same. If you have had a loved one injured or killed in a trucking accident, hiring a trucking accident lawyer is a good way of letting insurance companies know just how serious you are about your trucking accident case. 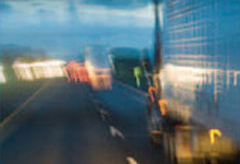 Trucking accidents are complex and require the attention of attorneys with extensive trucking accident experience. If a tragedy like this happens to you or your family, consider contacting Terrell Hogan.